Data captured by a ‘lost’ satellite mission involving the University of Southampton has provided scientists with vital information about gases in a galaxy cluster 240 million light years from Earth. The Japanese Hitomi X-ray satellite, developed jointly by NASA and the Japan Aerospace Exploration Agency (JAXA), has given astronomers an important insight into the Perseus galaxy cluster – a collection of thousands of galaxies orbiting within a thin hot gas, all bound together by gravity. 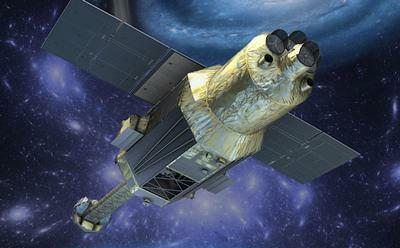 The Hitomi mission came to an abrupt end because of problems with its altitude control system, but the data it captured during its 38 days in space has allowed scientists to analyse the composition of the Perseus gases and gain a deeper understanding of the stellar explosions that created them. The gas in the Perseus cluster averages 90 million degrees Fahrenheit (50 million degrees Celsius) and is the source of the cluster’s X-ray emission. Using Hitomi’s high-resolution Soft X-ray Spectrometer (SXS) instrument, researchers observed the cluster between 25 February and 6 March, 2016, acquiring a total exposure of nearly 3.4 days. The SXS observed an unprecedented spectrum, revealing a landscape of X-ray peaks emitted from various chemical elements with a resolution some 30 times better than previously seen. In a paper published online in the journal Nature, researchers show that the proportions of elements found in the cluster are nearly identical to what astronomers see in our Sun. These blasts are thought to be responsible for producing most of the Universe's chromium, manganese, iron and nickel — metals collectively known as ‘iron-peak’ elements. The study suggests that the same combination of Type Ia supernovas producing iron-peak elements in our solar system also produced these metals in the cluster’s gas. This means both the solar system and the Perseus cluster experienced broadly similar chemical evolution, suggesting that the processes forming stars – and the systems that became Type Ia supernovas – were comparable in both locations. University of Southampton astronomer Dr Poshak Gandhi, who was among a 200-strong team of scientists involved in the international collaboration, said: “Despite the failure of the mission soon after launch, the precious few observations that we did obtain have proven to be transformational for our understanding of superheated cosmic plasmas. “Such plasmas outweigh known galaxies in clusters 10 to one, so are an essential component to our complete understanding of the Universe. The science in the new study was driven by the international Hitomi team, especially Hiroya Yamaguchi of NASA and Kyoko Matsushita of the Tokyo University of Science.